Being involved in a serious motorcycle accident can be a traumatic experience for victims. As such, their conversations and behaviors are likely the last things they're thinking about immediately after the incident. But, what a victim does immediately following a motorcycle crash—as well as in the subsequent days, weeks, and months—can have a profound impact on their ability to recover compensation for accident-related injuries and losses. What motorcycle riders know about what to do and what not to do in the aftermath can help protect the integrity of their personal injury insurance claims or lawsuits. Motorcycle accidents leave everyone involved shaken and on edge at a time when calm, cool thinking is imperative. Though some of these “don'ts” may seem obvious, or go against a motorcyclist's instincts, individuals are wise to keep them in mind throughout the claim process. Accept or place blame for the crash. It may be second nature for some people to automatically apologize for circumstances that aren't their fault, but doing so after an accident can be a costly mistake. After all, saying you're sorry after a crash isn't a courtesy, it's perceived as accepting legal liability and can be used against you when seeking compensation. Accept cash in exchange for not reporting the accident. Motorcyclists have no way of knowing the extent of the damage—both to their bodies and their motorcycles—immediately following a crash. 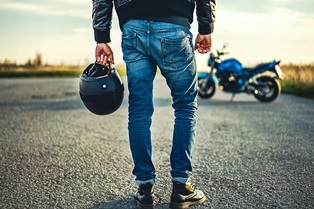 Accepting a hasty, under-the-table, on-site cash settlement can leave motorcyclists on the hook for tens or even hundreds of thousands of dollars in medical bills, property damage, and other losses. Forget to notify your insurance provider. Failing to report the accident to your insurance company may violate the terms of your policy, allowing the company to deny your claim. Provide a recorded statement to an insurance company. Insurance adjusters may sound friendly or imply that giving a recorded statement will make the claims process go more quickly, but information gleaned from that recording may be used by the insurance company to reduce its financial obligation to you. You're under no obligation to do this for the negligent party's insurance carrier. Talk about the accident, claim, or lawsuit on social media. Insurance adjusters may friend or follow you, or find other ways of combing through your social media accounts, looking for innocent posts, photos, or videos to misconstrue. Avoid posting anything about the accident or your subsequent legal case, and ask friends and family to avoid posting about you or tagging you in photos or videos until the case is resolved. What motorcyclists do after an accident is just as important as what they shouldn't do. These steps can help victims build a strong case. Report the accident to law enforcement. Make sure the crash is on record and that responding officers complete an accident report. Take photos or video of the accident scene, your motorcycle, and your injuries. Pay special attention to road or weather conditions that might have contributed to the collision, and begin documenting your injuries and losses. Exchange contact and insurance information with the involved motorists. Write down their names, addresses, phone numbers, license plates, license numbers, and insurance information. Gather statements and contact information from witnesses. This makes it possible for your attorney to contact them later, if necessary. Seek immediate medical attention. A prompt medical evaluation is essential—even if you don't feel seriously injured. Some accident-related injuries may not be symptomatic until later. Follow the doctor's treatment plan and attend follow-up visits as scheduled. Document your injuries and losses. Save medical bills and receipts; motorcycle repair or replacement estimates or invoices; documentation from your employer regarding lost wages; and medical records; and request a copy of the police accident report. A knowledgeable personal injury attorney can help you understand your legal rights and options after a motorcycle accident. If your injuries are the result of someone else's negligence, you may be entitled to compensation. Contact Rechtman & Spevak today by calling the numbers on this page or complete the brief contact form to request a free initial case consultation.